Hello! I thought it was high time I did an updated post on my favorite denim brand, Warp + Weft. I did a review and comparison back in September 2017 when the brand was still relatively new but now that they have grown and evolved a lot since then I thought it would be beneficial to do a completely new updated review since I don’t have the same critiques as I did back then. 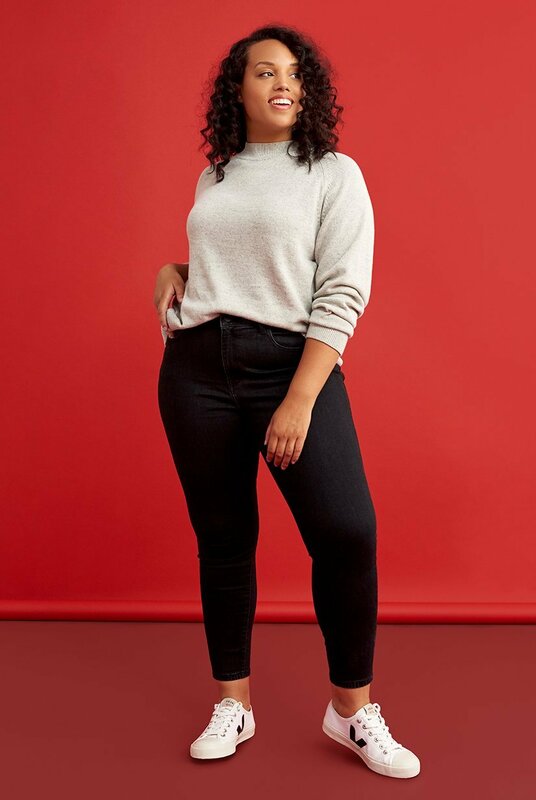 One of my main issues back when the brand was new is that they called themselves a size inclusive brand and seemed to really pride themselves on that, “inclusivity is central to everything we do,” but I didn’t find their initial launch to be very size inclusive because they started with more options for sizes 00-14 than the 14-24 range. 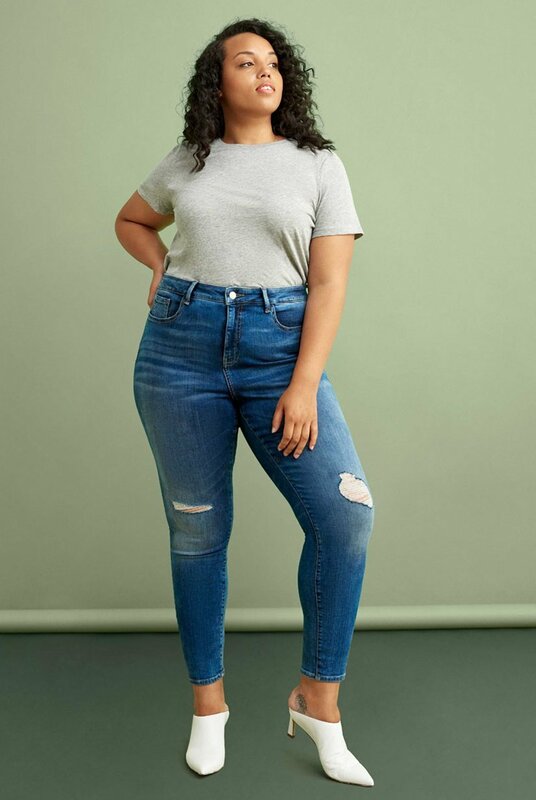 Over time I noticed that they had finally started introducing more and more styles to the plus size range and now they actually have one more style of jeans for sizes 14-24 than they do for 00-14! They do still offer quite a few more washes in the standard sizes than they do in plus but it’s a really big step to even just be offering the same styles for all sizes. I thought I would go through all the jeans I’ve purchased from the brand, including the few I’ve returned or re-sold, since my initial discovery and give you my current thoughts. Two of these are discontinued washes but I still wanted to include them for comparison sake. I also only used images from Warp + Weft to keep it consistent (plus mine are a bit worn and worse for wear at this point and would not photograph well). Let’s get to it! My first purchase from Warp + Weft were the JFK in Azure which are sadly no longer in production - I wold definitely repurchase these if they were because this is my favorite of the blue washes I’ve seen in this style. I bought my first pair back in September 2017 and was really unsure about the sizing so I opted for a size 20 (I’m usually an 18 or 20 depending on stretch). They were actually way too big for me and is why my first review was a bit sour because the fit just wasn’t good in a size 20 on me. Also, after only two months of wear one of the back pockets started completely coming apart from the back of the jeans. I angry Instagram storied it and the brand got in contact with me. I talked to them about my issue with the quality and sizing and they sent me a new pair in an 18 for free (very generous) and the 18 fit so much better. I still wished they were a little more fitted through the leg but overall these are still one of my favorites. 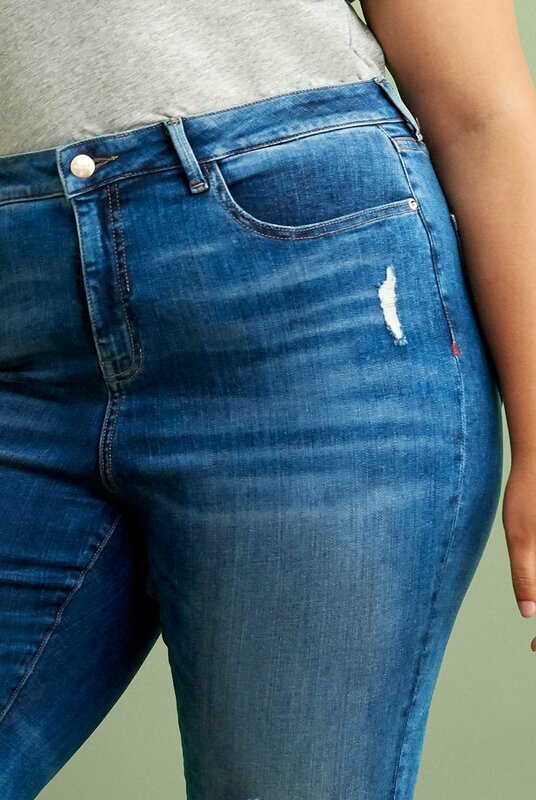 I love the dropped hem detail at the ankle which also makes them longer than all my other jeans, most Warp + Weft plus size jeans come in a 28” or 29” inseam, mine are a 29” but seem longer because of the dropped hem. The Azure wash is 93% cotton, 6% elasterell-p (type of polyester) and 1% Lycra so they’re stretchy but still hold their shape fairly well. I think from just looking at the two images I found that you can see that they weren’t very fitted around the knee and through the calf and that was where the fit always bothered me the most but I think now I’ve just gotten over it. This is all moot anyways since you can’t buy these anymore but I love the design elements in this wash and hope they bring out something similar to replace them. These were from my second purchase in January 2018 along with the next pair. Since this is a discontinued wash I couldn’t find very many photos but I can tell you that they certainly did not look anything like what the model is wearing when placed on on my body. I am what I call an “exaggerated pear” body shape and carry a lot of my weight in my hips so straight leg jeans usually don’t work out well for me but I wanted to give these a try. 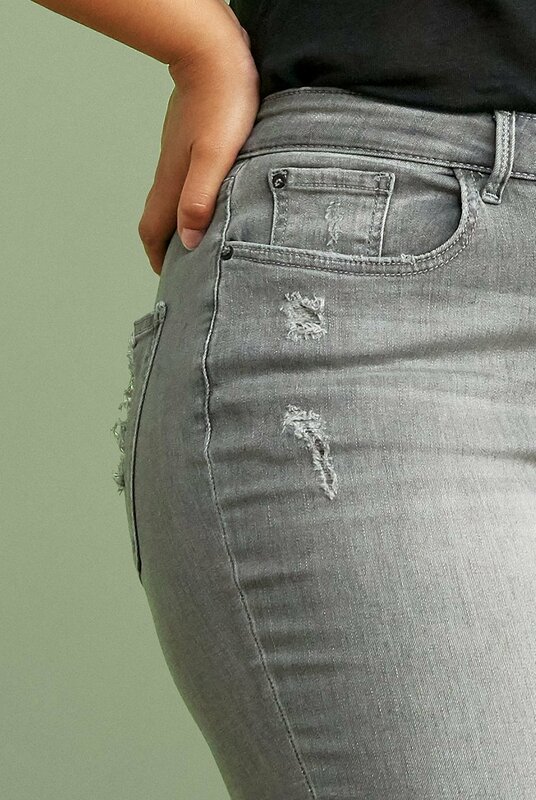 The Belle wash was in the classic denim so it was quite stiff and didn’t stretch hardly at all. I ordered a size 20 length 28” knowing there would be less stretch than the JFK and it’s a good thing because they just barely fit my thighs. They were tight in the thighs but too big around the waist and a lot looser through the rest of the leg which did not look very flattering on me. I held on to mine for a little while trying to give them a chance before finally giving up and re-selling them. Now they make the CDG style in their own Oneder fabric which has more stretch but I think they’ve updated the design because the leg looks wider than it does in these old photos (could just be a difference in how they fit the different models though). Straight jeans are just not my style so I wouldn’t try these out again but if you prefer straight over skinny you can check out the current available washes here. Now we’re into the pairs that are still available! The version of the Jackson wash that I own are in the Oneder fabric but they’re also available in what they call Power fabric which is denser (more on that in a bit). Composition wise mine are 55% cotton, 36.5% Tencel, 7% polyester and 1.5% Lycra - so quite stretchy and flexible, feel very jegging-like. I bought these because they were on sale and everyone needs a pair of black jeans. I’ve had mine for over a year now and color wise they’ve actually held up pretty well. I’ve had black jeans in the past that I would re-dye because they would fade so bad but these ones haven’t faded much. Mine are in the 29” inseam and I would call them ankle grazers on my 5’7” frame. If you’re in the market for a pair of black skinny jeans I would say these are nice but still not the skinniest of skinny jeans I’ve ever owned. This wash might be my favorite, or at least my most worn. The difference between the previous wash and the Blacktop wash is that there’s a slight fading around the edges (more noticeable on the images below). Mine are in an inseam 28” and are true ankle jeans so they look really good with pretty much any shoe. The Blacktop wash is in the Power fabric which is denser and has a stronger hold (read: feels more denim like). The composition of mine are 77% cotton, 21% polyester and 2% Lycra - there’s a noticeable difference in the weight of the fabric but these don’t feel stiff and are still quite stretchy and comfortable. This wash of mine has faded the most and noticeably on the inner thigh/crotch area. They also feel and look like they’re wearing down on the inner thigh but like I said, I think I do wear this pair the most and I will have had them for a year next month so I’m not blaming it on a quality issue, just usual wear and tear. If you want a more casual pair of black jeans I highly rate this pair! I bought this pair just this past October because I figured it would be the closest I’ll ever get to leather trousers. 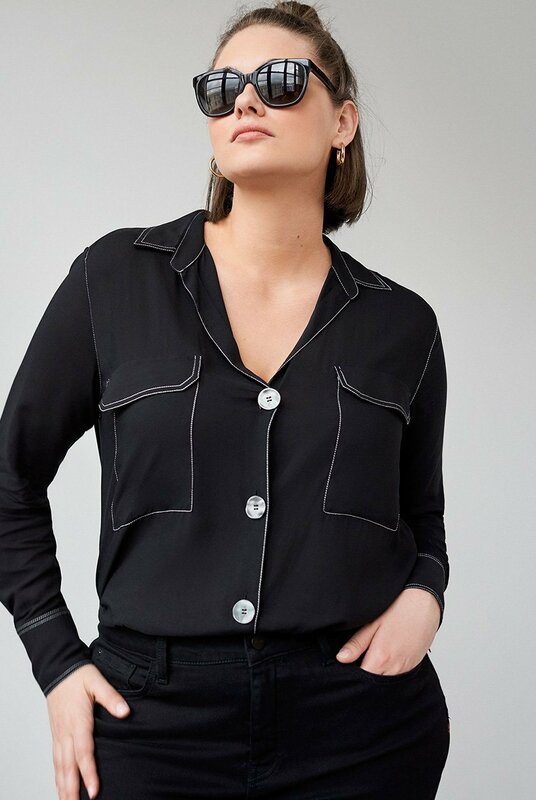 This pair comes in the Oneder fabric and the composition is 62% Tencel Lyocell, 23% cotton, 14% polyester and 1% Lycra - they’re super stretchy and I would say it’s a stretch to call these jeans and not just pants/trousers, at the very least I’d call them more like jeggings. I kept these and hindsight I kinda wish I’d returned them because I’ve only worn them out of the house I think twice. They look dressier from the sheen of the coating and I live a pretty laid-back lifestyle. They’re also quite noisy since my thighs touch when I walk and it kinda sounds like I’m wearing windbreaker pants. The fit also isn’t the greatest which I think you can tell by looking closely at these photos. In my personal opinion coated jeans should fit slimmer like the leather pants they’re trying to imitate but these are a bit too loose in the leg. I need to get more wear out of mine but I think I get tripped up trying to style them and actually wearing them out makes me nervous because of how loud they are but if I put it here and put it out into the universe maybe I can get myself to wear these more often. I think I’ve washed these once to get the creases from shipping out, I wash all my jeans as little as possible to keep them looking better longer, and the coating still looks brand new but that is something you’d have to be cautious of with coated denim. When I bough these back in October they were still going for $98 but now they’re $50 so I’m more than a little salty about that (though I did get mine with some sort of discount cause my receipt says I saved $49 between this pair and the previous). I’d been wanting a pair of grey jeans for a while and I liked the raw hem and all the distressing details on this pair so I sprung for them. They’re the Oneder fabric as well and have a composition of 59% cotton, 33% Lyocell, 7% polyester and 1% spandex - again, super stretchy and soft. I love the color of these but being that I’m plus size I get very self conscious in lighter colors on the lower half of my body so I haven’t worn these as much as I thought I would. I still really like them but they aren’t as flattering as a darker denim - there’s a darker grey pair in a shade called Ash in the Power fabric that I’m really keen to try. Still love the look of these though and I think I will get more use out of them in the spring/summer since I tend to pull out my lighter denim for the warmer months. This was the most recent pair I tried just a month ago. I got super excited when I saw these because the original description specifically said that they tapered to a slimmer ankle than the JFK. I was jazzed thinking Warp + Weft had finally figured out what a true skinny jean is and was gutted when I tried them on. They were not skinnier at all, were actually wider, and the distressing details hit at a really weird spot on the legs. The distressing on both legs are above the knee and just look and feel really weird, wish they would of put them over the kneecaps. The rise on these are very high, one inch higher than the JFK which are technically mid-rise but feel high-waisted on me (I do have a shorter torso though). I really don’t like this wash but they do offer them in a black wash called Eclipse which was sold out in my size at the time of my purchase but I would consider trying those. Trying to pass them off as something they weren’t really struck a cord with me though so I left a negative review and ended up being in contact with someone from the company. The guy I talked to basically said it was a mistake that they’d been labeled as being slimmer when in fact they’re just supposed to be a higher rise than the JFK. I sent him a photo showing all my JFK jeans laid out next to these and showed that they’re wider in the calf and he said that the leg widths are supposed to be the same as the JFK and that since this is their newest style there was just an error with the production this time around so hopefully that will be remedied in the future runs. I don’t have this pair in my possession anymore so I can’t tell you the exact composition but they are in the Oneder fabric so they’ll be really stretchy and feel and fit more like a jegging. If you want a skinny jean I don’t think you’ll go wrong with the JFK jeans and I trust that fit more so I’d recommend those over the MXP. As much as I love the brand I do wish they’d get it together and come out with a slimmer leg for plus size. I might be a bit chonky but I still like a really fitted pair of skinny jeans. 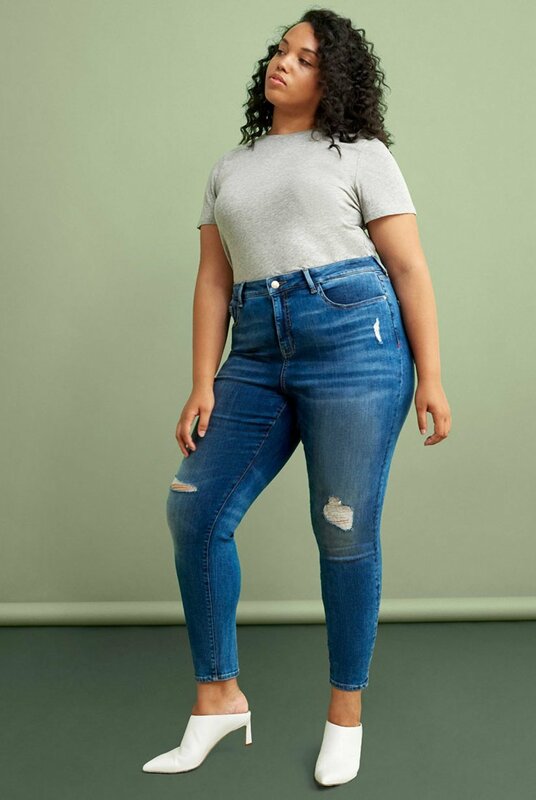 I have big but athletic built legs thanks to a year and a half of cycling classes so it might just be that the composition in my legs is what makes them not as tight as they are on some of the models but I think they could still come out with a more fitted pair (especially in the coated denim). 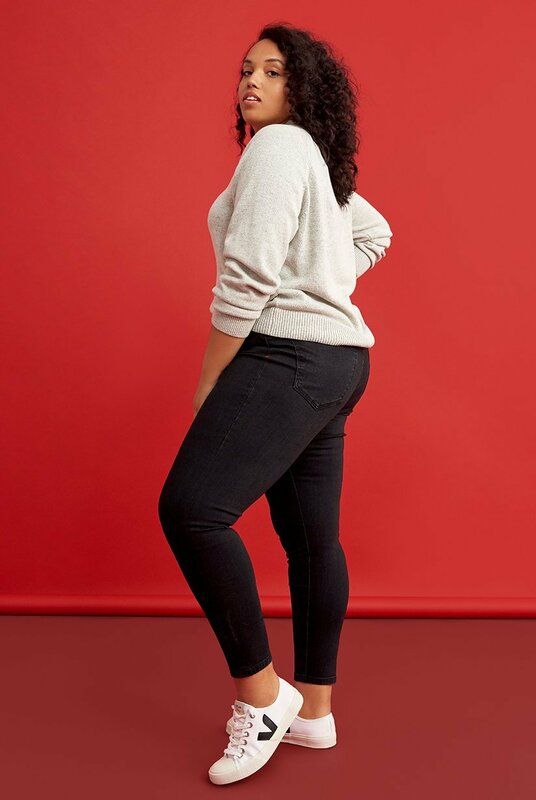 As a whole I really like Warp + Weft because their skinny jean styles fit a pear shaped body much better than other brands I’ve tried. They’re not cheap at around $100 a pair but I would say you get what you pay for in this instance and they do have a few select styles/washes for $50. I have an affiliate link with their referral program that gives you $20 off your first pair of jeans and then gives me $20 off my next purchase so feel free to use that if you want to try out the brand and save some coins. 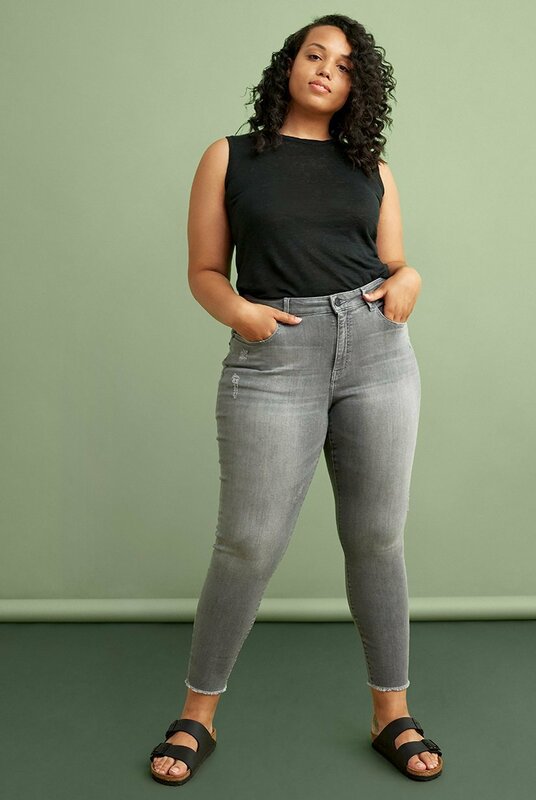 If you’re plus size and have full hips I’d start with the JFK jeans and go from there, my favorite wash that I’ve tried is the Blacktop. I took my old review down since it’s irrelevant now but I hope this updated review was helpful and can guid you through some of the brand’s styles a little better. If you’ve tried Warp + Weft jeans I’d love to hear your opinions down below, especially if you’re a very different size from me. That’s all I’ve got for you today, until next time!